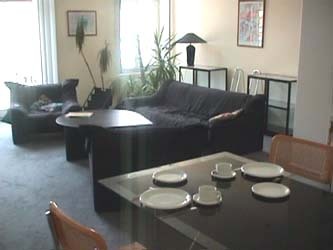 Furnished apartments are classified in this site. A few luxury non furnished apartments in the well-known Avenue Louise-area are also proposed (in a Master's House, from 150 to 250 sq.met.per flat). Furnished flats are in a medium range of prices (800 € to 2000 € all incl. ), are fully equiped and are located in quiet and safes areas close to the locations of the European Institutions (E.U.) and to the headquarters of most international firms present in Brussels. The furnishment and equipment include as a rule everything needed in daily life : general furniture, bed linen, fully equiped kitchen, TV + cable, telephone, washing-machine in the apartment or in a common place in the building, dishwasher in the largest ones, computer cabling, etc. Decoration is lovely. One or two or more bedrooms. Minimum duration of contracts is six months as a rule. We are no real estate agency, the apartements listed in this site belong to us or to friends, no fees are due to us if you rent a place thanks to this site which is the largest Belgian private website with apartments for rent in Brussels. A basic map of the areas where most selected apartments are located is provided in this site. Chose a category in the left frame.